As long as functionality, user experience, security and alternative payment methods are considered from the very beginning of the design process, all parties involved will reap the rewards. The Internet of Things (IoT) is not new. In fact, connected devices with a wide range of functionalities are already widely used in the home, a trend that shows no sign of abating. In fact, Gartner has predicted that there will be 20.8 billion connected ‘things’ by 2020, an increase from 6.4 billion in 2016 . However, with increasing demand for such technologies comes a shift in consumer expectation. Today as consumer awareness of IoT builds, there is the growing expectation that it should play a role at every touch point of their journey as a customer. In turn, such demand has encouraged payments to become the perfect ‘finishing touch’ and provide a pivotal role in the evolution of IoT. Consumers with connected fridges can expect to see food automatically restocked, and owners of electronic assistants, such as Alexa and Siri, will be able to purchase the latest items on their wish lists with a simple voice command. IoT and payment technology are also making significant strides in wearable items. For example, rings are being developed into ‘tokens’, meaning that they can replace sensitive payment account information, such as a 16-digit account number or payment card, to enable consumers to pay for goods with just a tap of the ring. As more IoT technology incorporates payment capability, it signals an exponential rise in the Internet of Payments (IoP) ecosystem. However, to ensure the IoT and IoP industries continue to flourish with the development of new innovations, it’s vital the industry maintains consumer trust and interest to ensure longevity. To do so, the IoT industry must address consumer demand with a focus on the overall customer experience. To maximise consumer buy-in, global technology companies should consider how they can continue to integrate payment capabilities into the development of new IoT products in order to create the most seamless experience for the end user. Considering the current state of play in the market, Visa is leading the way with its Visa Ready Programme for IoT initiative, which integrates the Visa Token Service into wearable items and mobile wallets. As part of this, it is partnering with companies such as Accenture, FitPay and Samsung. Visa are also working with Honda to develop technology that can detect when a car’s petrol is low and enables users to pay for a refill using an app that is connected to the in-car display. This is yet another example of how Visa are continuing to immerse payments into every touch point. It is this level of integration that holds the key to marrying the world of IoT and payments, and will encourage widespread consumer adoption. Ultimately, it’s an exciting time for tech developers, retailers and manufacturers looking to maximise the surge in consumer adoption, but it’s important that the user experience is kept front of mind from the very beginning to ensure payment capability is not a bolted-on feature. Only then will these solutions be as seamless and fit-for-purpose as possible. Accessibility is key and whilst connected appliances such as fridges, that automatically pay for depleted items, seem practical and useful in theory, in practice, developers and payment providers need to work together to also ensure that the payments’ ecosystem validates identity and addresses security risks. 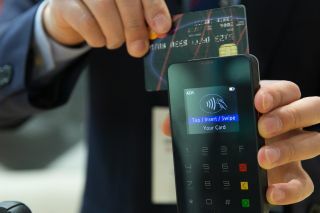 Trusting your fridge with your credit card seems a strange concept, but it is the role of those in financial services and payment providers to ensure that consumer data is protected, and a safe portal between merchant and consumer is created as a core part of the technology design. Considering 38 million transactions were carried out on a mobile device in 2016, (a 247 per cent increase on 2015) , it’s clear that consumers are receptive to using payment methods that promise the fastest, most convenient ways to pay. But, such growth can only be harnessed if user experience is prioritised. It’s important to consider that not all consumers will want their fridge aligned with their personal account, especially if there isn’t a certain level of security to ensure that they are the only ones who can initiate the payment. To address this, and ensure that the technology has mass-appeal, manufacturers must consider alternate payment preferences around the world. For example, Germany is predicted to become the second highest spender on IoT technology by 2020 , but its population’s preferred payment method is currently bank transfer. With that in mind, there needs to be some thought into how this technology can be altered to appeal to an international market. It is fundamental that payment preferences are considered at the very beginning of a product life cycle. However, to cater to international markets with differing payment preferences, payment service providers must be involved early in the design phases to ensure that the IoP ecosystem can continue to flourish worldwide. To make sure the future of the IoT and more specifically IoP, is a success, those manufacturing the technology need to work closely with third-party providers such as acquirers, issuers, merchants and processors to ensure that manufacturers can securely accept the deluge of new payment methods into their latest connected products. As long as functionality, user experience, security and alternative payment methods are considered from the very beginning of the design process, all parties involved will reap the rewards. Whilst it’s a market that is set for exponential growth over the coming years, it’s imperative that all stakeholders keep the end user front of mind. To do this it’s also vital that alternative payment methods are a key consideration throughout the development process to ensure that the technology is accessible on an international scale.